There is a book doing the rounds at the moment called "The Phoenix Project" which talks a lot about new ideas coming into the IT world around Kanban and devops. I've recently read it and I'll admit that it's got some interesting ideas but like any work delivery method these are ideas that must be embraced at a higher level than just in IT and the book does comment on this as well, unfortunately, the book is a bit of an ideal vision of how everyone gets on board with the kanban method of working and how it changes things for the better. I have no disagreements with Kanban, it's a good method to keep on top of things and I'm trying to make myself more disciplined in it's usage by having my workload in Trello and using that to prioritise. For those of you who don't know what Kanban is, the best way I can describe it is to think of a collection of five paper trays which are labelled In, Action, Filing, In progress and pending. In - This is new work that has arrived and needs to be prioritisedAction - This is Work in Progress, it needs to be done but is in the queue - whilst in the queue it's not generating any value.Filing - This is work that is completed but it just needs to be signed off/filed awayIn progress - This is work that is being done.Pending - This is work that is waiting on someone else, much like action, it's in a queue but in this case waiting for a third party. In Trello, I have columns (the kanban) that follow a similar pattern. This way, I know what I'm waiting on, what needs to be done and what is coming in. It's just my way of keeping myself organised. 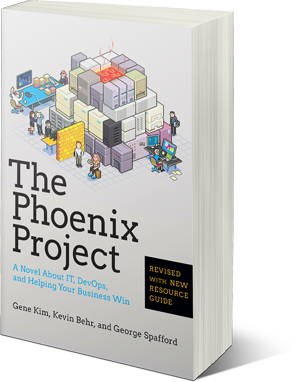 The phoenix project does a nice job of introducing Kanban and the whole work in progress flow although one of the characters is rather annoying as a deus ex machina who is there to kick the protagonist in the head and lead him down the right route. And that's the big problem with this book. It does a great job of introducing kanban and devops to the world of it, it cannot be faulted for that but it shows everyone happily pitching in and helping out when they see it work and there is the problem, in the real world it doesn't take much for people to slip back into old habits and screw themselves over. I've worked for quite a few companies in my years and I've done , , and now it's all about Kanban and Devops. Now, don't get me wrong, I actually highly approve of ITIL, Kanban and devops but once again, it's needs to be pushed from the top with EVERYONE getting involved to make kanban work. If you only have one or two people doing it then it's going to fall apart very quickly for the department. However, this is not a reason to not do this sort of thing on some sort of personal level, just to keep yourself organised. One of the most important lists I have in trello is called "known issues" where I make a note of an issue that I've spotted. This only needs to be a few words or a picture of the issue but it's come in handy a few times in there past where something has needed to be done and existing issues have had to be dealt with first but then I'm one of these annoying people who believes in taking notes so I think I'm more predisposed to working in a type of Kanban style anyway. Either way, I do recommend giving the book a passing glance. It's the first time I've seen a workflow method written down as a story so it's worth a look just for that and you never know, you might pick up a few tips.